Hosted by Ye Pyrate Brotherhood & the Long Island Maritime Museum -$7 per person , children under 5 FREE !! 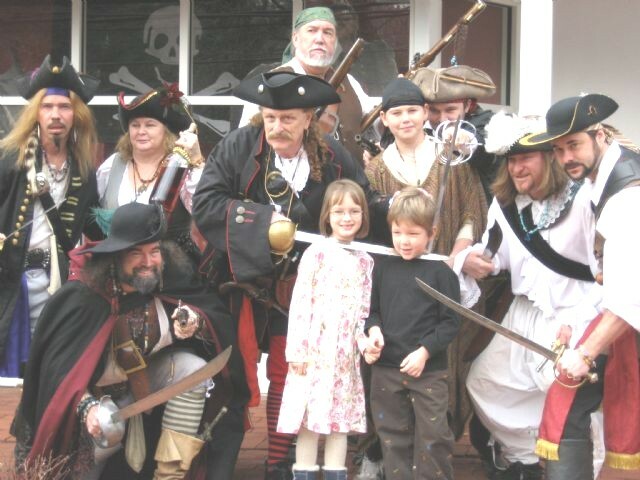 Join us on Father's Day weekend ( in costume if ye wish) as a multitude of cutthroat pirates, privateers, buccaneers and gentlemen of fortune descend upon the folks at the Long Island Maritime Museum, in Sayville, NY. There will be Pirate sword fights, period music and sea shanteys, food, shows and lots of shore bound vendors ta pick up some plunder! Living history pirate encampments and black powder cannon demonstrations. And of course, roving bands of pirates! Free childrens activities, including 16th & 17th century games and Powder Money races. Twice Daily - Children and Adult costume contests - so come as ye AARRRGGGHHHHH. Take time to explore the Museum itself, and immerse yourself in Long Island's rich Maritime heritage. Whaling, trade, rum-running and yes, piracy are all a part of our history and the Museum does an award winning job of presenting it. One of only seven maritime museums on the East coast. Listen to music from the Golden Age of Piracy ( 1680-1740) and beyond, from some of the best Pirate bands and sea shanty groups along the Eastern seaboard. Songs of plunder, the high seas, rum and, of course, pretty wenches will be roarin' to the skies! Costumes are encouraged, be it only yer eyepatch, tricorn hat or come in full privateer regalia!! Planet Amazonian Imports, and lot of food vendors ! Be sure and stop by at the the booths of Pyrate's Way Magazine, Pirates Realm, and Pyrate.com. Come join the hostilities.... er, we mean fesivities !! PLEASE NOTE: we have obtained a special discount rate at the Hilton-Garden Hotel, Bohemia, of $99.00 per night, 631 738-7800, and mention the Long Island Pirate Festival. Camping is available at the Heckscher State Park, only minutes away from the Museum. Book soon, it is a very popular campsite. Weapons Policy: All edged weapons and PERIOD flintlocks are to be peace tied. Participants wishing to fire at the salvos must have their weapons checked by the Black Powder Marshall. Promotions: Karen Gaconnier , L.I. M.M.